Integration is key to healing on every level. The Ancients knew this and now we are remembering that which was once known. The Mayan Vision Serpent was believed to be a direct link between the spirit realm of the gods and the physical world. It is often depicted with the spirit of a god or ancestor emerging from its jaws. According to the Maya, it is the axis atop the World Tree, which lies at the center of the Universe. This center axis, which the two create, communicates between the spiritual and the earthly worlds or planes. They create a doorway to the spiritual world, where one can access their innate power and integrate it into their physical experience. 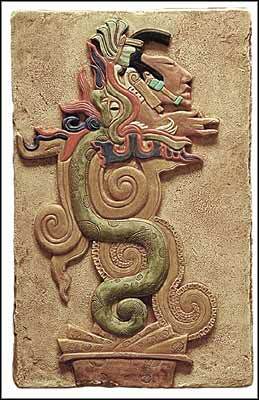 To the Maya, serpents were a very important social and religious symbol. In Maya mythology, these revered serpents are described as the vehicles by which celestial bodies, such as the sun and stars, cross the heavens. The shedding of their skin made them a symbol of rebirth and renewal – a means by which we constantly regenerate, as we walk through one doorway of experience to the next. The Earth experience is one of learning to consciously integrate physical and spiritual into an abundantly limitless, joyful, creative, magickal and unconditionally loving manifestation. Posted on June 2, 2011, in Uncategorized and tagged dreams, maya, maya mythology, mayan vision serpent, mayans, portals, serpent, serpent symbolism, symbols, World Tree. Bookmark the permalink. 2 Comments.